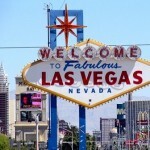 Can the Utah Jazz Make The NBA Playoffs This Season? The Utah Jazz hasn’t made the playoffs in four consecutive seasons. Last year the Jazz were close, missing out on the final playoff spot by just one game. This year, however, the Jazz finally have a chance to break that streak – they are off to a great start to the 2016-17 campaign. So, can the Jazz make the playoffs this year? Let’s examine their chances this year? Let’s discuss their chances. What the stats are saying? The Lakers March Schedule 2015 will have seven games at Staples Center. LA will be on the road for nine games during the Lakers March Schedule of away games. With the surgery of Kobe Bryant, it became official Lakers have lost the season. Now, the only thing left to do is to try and secure a top 5 draft pick. In another case, the pick goes to the Phoenix Suns, and the Lakers will lose a valuable asset in their rebuilding project. In March, they will play few games with direct rivals for a higher pick. The trick is that the Lakers must lose those games to stay in the play for the pick. At the moment, the Lakers have the 4th worst record in the league which guarantees them a top 5 pick. But they can get “lower” and grab a higher pick. After rejecting the Lakers during the offseason, this will be the first time Carmelo will come to LA. The duels between the Knicks and the Lakers were once an epic matchup, but the two of the largest NBA cities have fallen. And with the Knicks in town, there will be millions of side stories about Phil Jackson, Melo, Derek Fisher and much more. The score between the teams is 2-1. But the fun part is, the Lakers are probably the only team in the league that have scored 100+ points versus the No.1 defence in the league in every game they’ve played. Los Angeles has no problem scoring versus Golden State, but the problem is how to defend them. At least the fans can enjoy a high scoring game. View Tickets. Jazz @ Lakers Staples Center March 19th. This will be the last duel of the two teams. There was a time when LA had a better record than the Jazz. But they started losing, and the Jazz won few games. Now, the tables are turned. Neither team has a chance to make the playoffs, which means the duels will decide to rank in the draft. The Jazz won the first duel between the two teams in Utah. Sixers @ Lakers Staples Center, March 22th. The Lakers and Sixers have yet to play this season. But in March, they will play twice, once in Los Angeles and once in Philadelphia. The difference between the teams in the standings is two games, so these duels might decide who gets a higher pick. Lakers @ Timberwolves Target Center March 25th. With the return of Ricky Rubio to the lineup and the growth of Andrew Wiggins, the Timberwolves have begun to win games here and there. And with Lakers losing as they do, they might overcome the Timberwolves as the worst team in the Western Conference. That won’t be a bad thing, considering the lower the seeding, the higher the draft pick. 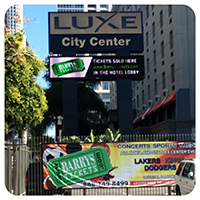 The Staples Center Address is 1111 South Figueroa Street, Los Angeles, CA 90015.Barry’s Tickets also offers Staples Center Parking for all Lakers games and events at the Staples Center. Barry’s Tickets physically stocks the largest assortment of secondary market Clippers Tickets at the Staples Center anywhere and offers tickets to match all budgets including Clippers Courtside Tickets, Suite Level, Lower Level, Premiers, 200 and 300 level tickets as well as Parking for all games at Staples Center. The Utah Jazz February schedule of games is very tough. Almost 80% of their games are versus playoff teams. Most notably western powers such as the San Antonio Spurs, Dallas Mavericks, Houston Rockets and Memphis Grizzlies. However, on the other hand, the experience playing versus them is precious, and the Jazz needs experience and a high draft pick. The team from Utah already has a plethora of young players, but another top 5 or top 7 picks won’t hurt. They also play the Lakers, a team they directly fight for a higher pick. The Jazz February Schedule last season saw 12 games played. The Jazz ended February 2014 with a 5-7 record. The Jazz was 6-6 in their February schedule back in 2013. Ticket prices for the Utah Jazz also tend to dip in February. 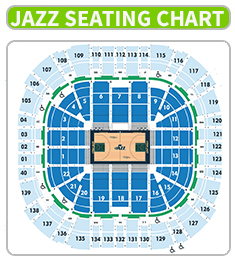 The 2014 Utah Jazz February schedule saw a -62% drop in ticket prices on the secondary market. With the Jazz currently 14-28 and almost out of the playoffs statistically there is no reason the same trend won’t happen in 2015. 5 top games in the Utah Jazz February schedule. The Jazz starts the month of February versus one of the top 3 teams in the West. To put it kindly, the start couldn’t be harder than this. The teams have never played so far this season, and this will be one of the two duels in February. The second is on 20th February, in Utah. The Kings started the season strong, but they fall to earth once Demarcus Cousins suffered nasty meningitis. From there on, they fired their coach, and the team is now in no man’s land. They are away from a playoff spot, and they need to lose a series of games for a higher draft pick. They are doing the later excellent in the past few weeks, having lost 7 of their past 10 games. Even worse for Utah, they are “catching” the Jazz for a high draft pick. Fun fact, the Jazz won the first duel between the teams, and the game was also played in Utah. In San Antonio, the Jazz managed to score only 69 points and lost. If they win now, they have a chance to win the season series with the Spurs since long time ago. But that won’t be easy at all. But the most important silver lining from the game is the experience playing versus a true team. The Jazz won the first matchup, but it might be better for them to lose this one. Nobody wants to lose, and publically tank, but the Jazz are in a position that they cannot go much up in the standings. The duels with the Lakers are a meaningful factor in deciding who is ranked lower and who gets a higher pick. This especially applies for the Lakers, who would love to have their pick in the top 5, since they will keep it in that case. The two teams that play in the same conference were playoff rivals around 5-6 years ago. Back then, Carmelo was playing for the Nuggets, and Deron Williams was playing for the Jazz. But things have changed, and the two teams are now at the bottom of the Western Standings. However, a division game is always fun to see. The key thing to watch in this game is pace. Utah boasts the third slowest pace in the league, and Denver plays at the fourth fastest pace in the league. All Utah Jazz February Schedule Ticket Prices are subject to change and based on the secondary ticketing market. The Cavs are slowly starting to look like the championship contender many envisioned them to be when they signed LeBron James and traded for Kevin Love. There are still bumps on the road, and the roles are not clearly defined, but the team is playing better and better. It took the Heat one year to find out how they should play, and an injury to Chris Bosh to finally grasp and embrace the idea of position-less basketball and place the ball in James’ hands. The Cavs took less time, as Irving is slowly learning to play off the ball, and let LeBron create more for others. The biggest problem is their defence, but they are getting there. LeBron claimed they should win all 82 rebound battles during the season, but that hasn’t happened, even though the team has excellent rebounders in Anderson Varejao and Kevin Love. This is their home schedule for the Quicken Loans Arena January. Another duel where the Cavs are poised to lose the rebound battle. Just a few days after hosting the Mavs and Tyson Chandler, Dwight Howard and the Rockets are in town. And the Rockets are another team with many weapons, particularly on the perimeter, where they can shoot lights out. James might have to guard Harden, the leading scorer at the moment. Love is one player that can hurt the Rockets, as they do not have someone who can step out and is mobile enough to guard Love. The duel of two former MVP players is sure to produce some entertainment, and probably some bad blood. James is not liked in Chicago, and neither does he love the Bulls. Joakim Noah has tossed some words towards LeBron multiple times. While he was with the Heat, James was an obstacle the Bulls could not pass. Now with the Cavs, he might be even more dangerous. And we cannot forget Kyrie Irving and his duel with Derrick Rose. You better bet LeBron hasn’t forgotten the first duel between the teams and Gordon Hayward’s game-winning shot over James. The Jazz better is prepared for James’s revenge, as he is known to remember things. Even though he doesn’t show it, LeBron is a player with a long memory. And he knows how hard his duels with the Jazz are, and how much he hates losing in Utah. Now at home, he will probably show them good he is. The Hornets are looking to trade Lance Stephenson; the player LeBron loves to play against. The Cavs won the first duel of the season. The Hornets are still in a mess, but they do have one player that can punish Cleveland, and his name is Big Al Jefferson. No player on Cavs roster can guard Jefferson inside, and he was a problem for James as well. The point guard matchup between Kemba Walker and Kyrie Irving is another one to watch for. Is there a better matchup and a duel in the league than this one? The Thunder won the first game of the season, but that was with James in street clothes. Just think about, Ibaka vs Love, Irving vs Westbrook, and of course, James vs Durant. Three premium matchups at three different positions make this game a must watch. In the first week of the season, the Blazers dominated the Cavs in their first matchup. But Cleveland is a much better team now, with chemistry improved and their team play improved as well. The teams have top 5 players on two crucial positions, point guard and power forward. However, how Batum defends LeBron might decide the duel. And we cannot forget Wesley Matthews, a player who thinks is the best at his position and can go hot on a given night. All Cleveland Cavaliers Tickets are 100% verified and guaranteed to be authentic as well as delivered on time. You can learn more about our Interactive Cavaliers Seating Chart and multiple ways to purchase tickets. You can also view the entire Cavaliers schedule for both home and away games. Each year as the start of the new NBA season approaches will always look to the draft to see which players will be successful and which ones are lucky to be drafted. There is still a draft pick or rookie that will make an instant impact each year and will make his statement for the rookie of the year. This year is no different. There are a few rookies that have been drafted that stands out above the other rookies. You can look for the following names to be mentioned when it comes to rookie expectations. 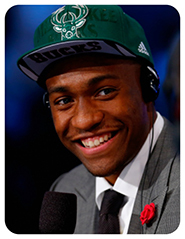 Jabari Parker was drafted by the Milwaukee Bucks and is currently playing forward. In his October 9 outing against the Detroit Pistons he put up 11 points and added three rebounds with one assist and one still. That was with 31 minutes of playing time. He has been used at both forward positions but still a question as to where he will be positioned during the regular season. No matter where Coach Jason Kidd will place him in the lineup look for Jabari to be a huge contributor and make a nice run for the rookie of the year. Nerlens Noel is having a somewhat rough start to the season. Being drafted by the Philadelphia 76’ers to play forward and center he does have the potential to be a strong defensive presence in the NBA. After playing in the first two preseason game for the 76’ers, he is listed as day to day while he is nursing an injured right thigh. Look for Noel to be healthy for the regular season and to improve the more he plays. Andrew Wiggins showed why he was drafted by the Minnesota Timberwolves when he scored 11 points by shooting 5 for 10 from the field against the 76’ers on Friday night. He also added three rebounds. Three of his eleven points came from one three-pointer. Playing at guard and forward he will go through some slumps as does everyone else but look for him to put together a streak of consistency playing an average of thirty minutes per game. Dante Exum, a rookie guard for the Utah Jazz played twenty-nine minutes in his October 8 outing off the Jazz bench. He was a little rusty only hitting one of his five shots. This won’t last long because he will have to improve to gain some sharing time with starting point guard Trey Burke. He will have to develop his ball skills to make his run at rookie of the year. Exum is one to keep an eye on throughout the year. Julius Randle a rookie forward for the L.A. Lakers will have to make some adjustments if his last outing on Friday night is any indication of what is to come from this rookie. He only played eighteen minutes and shot a low 4 out of 12 from the field. The Lakers will move the ball around a lot, and Randle needs to get used to the ball movement so he will learn his placement on the court. He will need more playing time to develop his confidence. But he will get better and make a strong push during his 2014-15 season year. 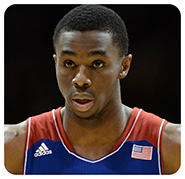 According to Google Trends Andrew Wiggins is getting the most interest by NBA Fans! Take $15.00 off any NBA Tickets use discount code NBA2015 at checkout!